Make your own Valentine Cards for your love ones for this special occasion! Making Valentine Cards is always exciting as you are doing it for one simple reason......LOVE! Imagine when the cards delivered to the hands of your love ones, they will be very touched because you handmade the greeting cards by yourself, it's very sentimental cards! With simple craft technique, you can easily handmake the Valentine Greeting Cards using simple materials, embellishments or make it 3D. More Valentine Cards will be posted here for your future projects. Here, I use rubber stamp with cute cat picture and figure of heart shape balloon with the wording "I love you...." to express affectionate on the card. So, start your first handmade Valentine Card now! - clear stamp : heart shape with wording "I LOVE YOU" by Meredithf Enwickde signs "heart stamp four"
**This craft is suitable for adults and kids from 7 years old and above. Adult's supervision is advised when kids are doing crafts with scissors, penknife, embossing or using electrical gadgets and any chemical solutions. 1. Apply black color pigment ink on the rubber stamp then stamp on a yellow art paper. 2. Colour the cat picture to enhance it. 3. Tap the pink color ink ( Versa orchid-34 ) on the clear stamp then stamp it on a white art paper and colour it with color pencil, cut it out. 4. Use the heart shape cut out as guideline, put it on top of a craft foam and draw the outline as shown then cut it out. 5. Apply glue and paste the top heart shape slanting away from the craft foam underneath. 6. With penknife, cut about 3mm line next to the cat's leg. 7. Cut about 4 to 5 inches in length of the wools. 8. Insert the wools thru the hole you just cut behind the cat's leg and the end of the balloon. 9. Cut the shape of the cat and heart shape balloon. 10. Then paste on a piece of Baby-blue art paper which is folded into half as shown. 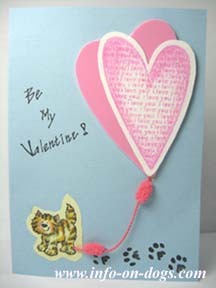 Stamp the cat's paws on the bottom of the card then write "Be My Valentine" at the left side of the card. 12. Stamp "Be Mine" on a piece of white paper then cut it out and paste inside the card, on the front page use the marker and pen the words "Be My Valentine! ".